"New Italian Cuisine" and the most famous Italian chef in the world. 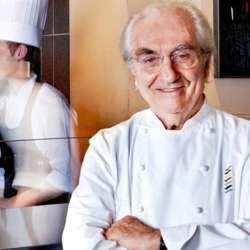 Marchesi opened his first restaurant in Milan in Protected content , already obtaining a Michelin star one year later. In Protected content , the restaurant became the first in Italy to receive the recognition of the three stars of the French guide. The Foundation Gualtiero Marchesi, created on the occasion of its 80th anniversary, has for mission to spread "what is beautiful and good in all the arts". To return to the gastronomic revolution by Marchesi, a round table brings together star chef Enrico Crippa (three Michelin stars for his restaurant Piazza Duomo in Alba), Alberto Capatti, professor of history of French civilization at the University of Pavia and President of the Marchesi Foundation, Simona Marchesi and Enrico Dandolo, respectively the Vice-President and the Secretary General of the Foundation. The evening will close with a preview of the documentary Gualtiero Marchesi: The Great Italian by Maurizio Gigola [Italy, Protected content , 60 ', vostf]. The film traces the life and thought of the man who revolutionized Italian cuisine, raising it at the highest rank of international gastronomy.